Serena Van Rensselaer was originally a student of Art History and Cultural Anthropology, but while studying abroad in San Miguel D’Allende, she discovered her untapped passion and aptitude for jewelry design. She is now an inspired creator, perceptive businesswomen and shrewd gallery manager in Manhattan’s picturesque Soho neighborhood. We recently visited Serena’s gallery and spent the afternoon speaking with her about the industry. If you’re a jewelry designer interested in marketing and selling your finished work, determining how to begin this venture can be an extremely daunting task. Many artists make the decision to partner with a jewelry wholesaler- the people who help supply retailers across the country. Collaborating with a wholesaler can be a great opportunity to get more exposure for your work, but there can also be a great deal of pressure and demand involved. 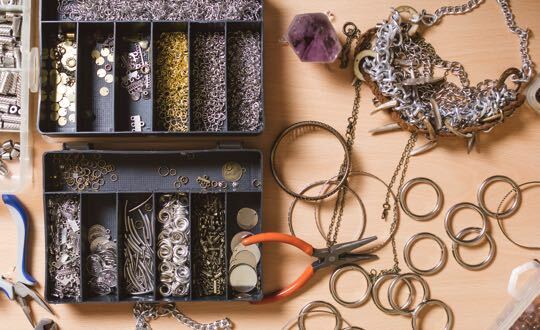 We want our students to be prepared, so we asked jewelry designer, gallery manager and NYIAD mentor Serena Van Rensselaer (who’s worked with wholesalers in the past) to share her insight on this topic. If you’re considering the wholesale route for your personal business venture, here are some things you should know. Wholesale is a huge market. Large stores and boutiques stock their shelves with jewelry items purchased from wholesalers across the country. When Serena was involved in the wholesale business, her work was being sold globally- throughout the United States as well as in Japan. The market is ALWAYS in demand. Anyone has access to purchase wholesale jewelry- and tons of people do. Purchasers are constantly trying to keep up with shifts in fashion trend and style popularity, and they need wholesalers to accommodate that necessity. You’ll be working to meet strict deadlines. Serena was required to provide unique new collections to her wholesale partner 4 times a year. In order to meet these deadlines and market cutoffs, she sometimes felt she had to rush her work and sacrifice some artistic freedom in order to finish on time. Your knowledge of style will always be sharp. When providing collections for a wholesaler, it’s very important to keep up with trends and modern styles. This will ensure that your designs are contemporary and current, which will increase the probability of buyers being interested in them. Serena recommends keeping an inspiration board- she pins photos, magazine clippings, color swatches (or anything else that motivates her) onto a large panel that she can refer to for inspiration when she’s feeling creatively drained. Working with a wholesaler is a great opportunity for jewelry designers to practice time management and market supply. If you’re hoping to sell large quantities of your work, partnering with a wholesaler will give your items abundant exposure to a large audience of potential buyers- but if you’re the type of artist who stresses under pressure, it’s important for you to understand the wholesale market before you find yourself in over your head. Want to learn more? The New York Institute of Art and Design offers an online jewelry design course that can teach you how to create and sell your own unique line of jewelry. Request your free course catalog today! By: Michelle Ecker on January 5 2018. By: Haley Mindes on November 17 2016.